The economy of the 17 countries that use the euro grew by 0.8% in the first three months of 2011, up from 0.3% in the previous quarter. Germany was largely responsible for the better-than-expected figure, reporting growth of 1.5% in the period. There was a surprisingly strong 0.8% growth rate from debt-laden Greece. France grew 1%, Italy and Spain grew 0.1% and 0.3% respectively and Portugal slid into recession after contracting for the second quarter in a row. Growth there declined by 0.7%, following a 0.6% contraction in the final quarter of 2010. "This is almost certainly as good as it gets for the eurozone and growth seems likely to moderate over the coming months in face of significant headwinds," said Howard Archer at IHS Global Insight. Having been in Germany yesterday, I must admit to being surprised to hear that Germany grew by 1.5% in the first quarter. Businessmen and economists I spoke to were upbeat, certainly, but not euphoric. Even with some encouraging recent growth in consumption, they know that the economy is still highly dependent on demand from the rest of the world. They are also hugely vulnerable (economically and politically) to what is happening further south, with today's figures showing Portugal shrinking by 0.7% and the Spanish economy now only 0.8% higher than a year ago (versus 5% larger in Germany). Greece's positive showing in the quarterly figures was a surprise, although compared with the same quarter of the previous year, the economy has contracted by 4.8%. Platon Monokroussos at EFG Eurobanka said the figures were, "a huge positive surprise, a reading that is significantly above market expectations". He attributed the growth in the quarter to a recovery in exports. Ken Wattret at BNP Paribas said: "Big picture-wise, once again the theme is divergence between the core and periphery and the core countries account for the vast majority of euro area output. "The periphery are getting the worst of both worlds. The core countries like Germany are doing really well and that's keeping the euro strong, and it's making the ECB [European Central Bank] more inclined to tighten policy." He added that what the countries on the periphery really needed was low interest rates and a weaker euro. Portugal's downturn is expected to get worse as a result of the austerity measures agreed as part of its bail-out by the EU and the IMF. Italy's growth figure was worse than expected, with the 0.1% rate the same as it was for the last three months of 2010. Last month, the Italian government cut its growth forecast for the whole of 2011 from 1.3% to 1.1%. The rise in Spain's latest quarterly growth rate to 0.3% from 0.2% in the previous quarter is more encouraging as the country tries to avoid a third consecutive year of contracting GDP. It is struggling to deal with an unemployment rate of 21.29%, which is the highest in the industrialised world, as it attempts to recover from the financial crisis and a property slump. For comparison, UK GDP grew by 0.5% in the first three months of 2011 and the US by 0.4%. Figures earlier in the week showed that German exports and imports had both risen to their highest monthly level since records began in 1950. Germany's GDP figures from Destatis showed that domestic demand had been one of the strongest drivers of growth. 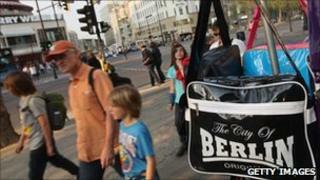 The country's growth figures were "fantastic", according to Christian Schulz at Berenberg Bank. "Consumption will become more and more the engine of growth in the future, since unemployment is dropping starkly," he said. "France also expanded robustly. The eurozone core remains the anchor for the entire currency union." France's growth rate was its fastest since the second quarter of 2006. France's economy minister Christine Lagarde said she was now "very confident that the (government) forecast of 2% growth for 2011 can be met". She added that the manufacturing sector had been a particularly strong driver of growth in France.